The Red and Gold also continue to remain unbeaten for a third season on the trot. 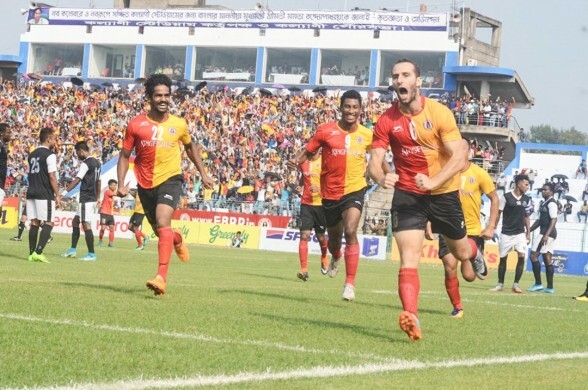 East Bengal were held to a 2-2 stalemate by Mohun Bagan in the season’s first Kolkata Derby at the Kanchenjunga Stadium, Siliguri in the Calcutta Football League (CFL). Azharuddin Mallick (1’) and Ansumana Kromah (47’ pen) were on the scoresheet for the Green and Maroons while Laldanmawia Ralte (43’) and Mahmoud Al Amnah (62’ pen) were on target for the Red and Gold brigade. The draw also sees the Red and Gold seal a record 39th league title. The Red and Gold coach Khalid Jamil made two changes from the first XI against Tollygunge Agragami. 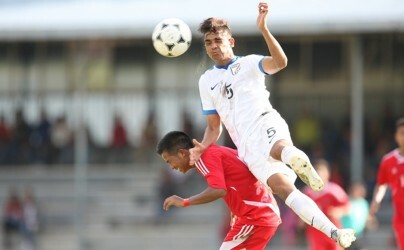 Tonmoy Ghosh and Arnab Mondal made way for Samad Ali Mallick and Mitchell respectively. On the flip side, Green and Maroon coach Shankarlal Chakraborty made three changes to his side that played against Peerless. Arijit Bagui, Shilton D’Silva and Ricky Lallawmawma came in for Debabrata Roy, Surchandra Singh and Gurjinder Kumar respectively. Bagan began brilliantly scoring in the opening minute of the game through an Azharuddin Mallick blinder which Mitchell failed to clear and the ball found the net. After conceding that goal, the East Bengal players looked desperate to level the scoreline. As a result, they kept on counter-attacking in Bagan’s half. After several deadly attacks, East Bengal’s fortunes turned at last in the 43rd minute courtesy a dual attack from the Mizo duo of Lalramchullova and Laldanmaiwa Ralte. An unmarked Lalramchullova chipped the ball to Ralte and the No.17 did not make any mistake to put the ball in. The first half ended in a 1-1 stalemate. The story was scripted the same way in the second half as Mohun Bagan got an early penalty in the 47th minute when Mitchell trapped and pulled down Kamo Stephane Bayi inside the box. Ansumana Kromah made no mistake to make the scoreline 2-1 in favour of Bagan. With East Bengal just needing a draw to clinch the title, Bagan had to win at any cost to bring back CFL trophy home after a gap of seven years. In the 62nd minute, the Red and Gold brigade were awarded a penalty when Laldanmawia was trapped from behind by Raynier Fernandes at the edge of the box. Syrian international Mahmoud Al Amnah made no mistake to convert the penalty to make it 2-2 for Jamil and his men. At the fag end, the contest turned out to be full of action and drama as both teams were down to 10 men each. Bagan’s Kinshuk Debnath was given his marching orders after a spat with the referee while East Bengal’s Surabuddin Mallick was sent off after he trapped Chesterpaul Lyngdoh from behind.